Friday October 1st 1926 Weather very warm. Grace asked me to go to the fair with them but I did not feel like it. Did some crotcheting in PM and took a nap. Art & Ellen to the fair in the evening. We sat on the porch till bed-time. Saturday October 2nd 1926 weather still warm. Letter from Hattie. Wrote her in PM, crotched some later and took a nap. Art & Ella out to the fair in the evening. A telegram from Sister Ida about eight oclock forwarded from Delavan told that Aunty Electa died yesterday at noon and she left Granville with her tonight for burial at Roseville, Ill. The telegram startled me. 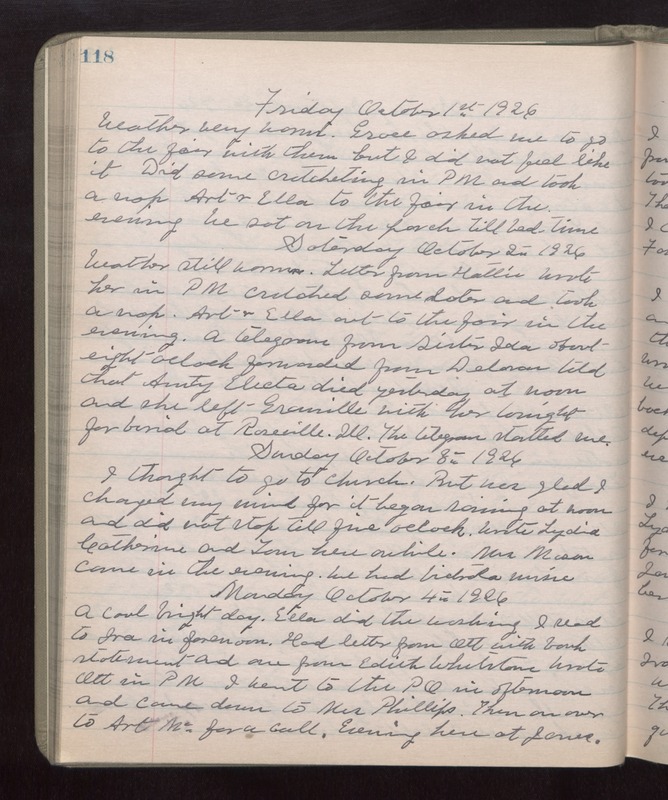 Sunday October 3rd 1926 I thought to go to church but was glad I changed my mind for it began raining at noon and did not stop till five oclock. Wrote Lydia. Catherine and Tom here awhile. Mrs Mason came in the evening. We had Victrola music. Monday October 4th 1926 A cool bright day. Ella did the washing. I read to Ira in forenoon. Had letter from Ott with bank statement and one from Edith Whetstone. Wrote Ott in PM. I went to the PO in afternoon and came down to Mrs Phillips. The on over to Art Mc--- for a call. Evening here at home.